According to a Comscore survey, Professional social network LinkedIn, surpassed Myspace in terms of number of unique visitors to social networking site in the U.S. in the month of June. It stands on the second position behind Facebook. 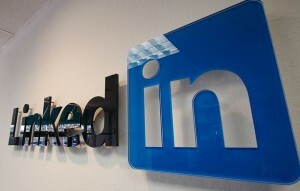 There has been a significant increase in the number of visitors after Linkedin announced its IPO in May. Linkedin saw 33.9 million unique visitors in June while Myspace had 33.5 million unique visitors. 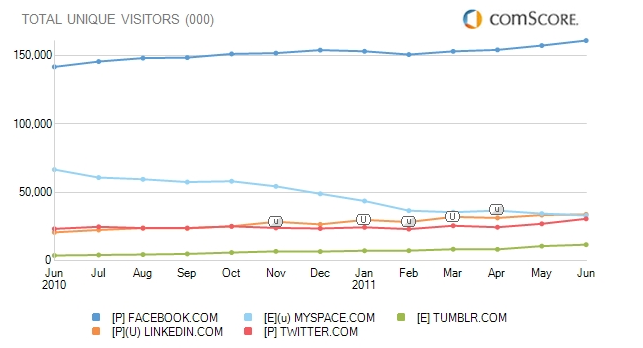 From the graph below, we can see that Myspace has seen a nearly constant decline in terms of its unique visitors. Recently it was acquired by Specific Media. May be the new owners help it gain more numbers of visitors and restore its position in social media. Twitter is also not very far behind. It had 30.6 million unique visitors in June, compared to 27 million unique vistors in May. Twitter has seen a constant growth over past few months. The company has very well focused on the mobile access space and the third party clients which let users access the network. Also it is strengthening itself on the advertising front. Facebook saw the most number of unique visitors in the U.S. which was nearly equal to 160.8 million. It had 157.2 million unique visitors for the month of May. Recently, the company also announced that there are nearly 750 million active users on Facebook which is quite a milestone in itself. An important fact that is that the survey does not cover is the amount of time spent by the visitors on the different sites. Here Linkedin may get a little less share. Although it has been working hard in introducing new features and functionality to let the users spend more time on the site, it would be quite interesting to see how far it has gone in the terms of the total time spent.